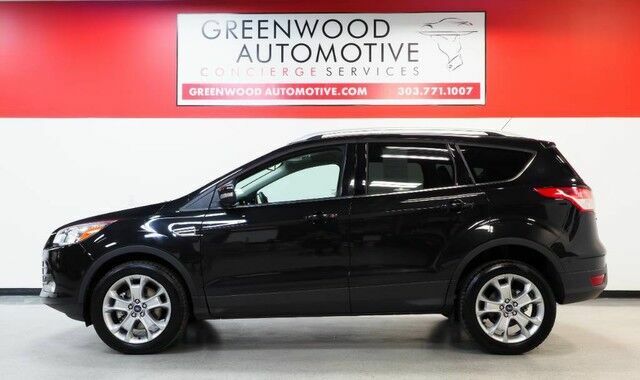 Greenwood Automotive is honored to present a wonderful example of pure vehicle design... this 2014 Ford Escape Titanium only has 34,482mi on it and equipped with Navigation and the 2.0 l4 GTDI EECOBOOST ENG could potentially be the vehicle of your dreams! This 2014 Ford Escape comes with a CARFAX Buyback Guarantee, which means you can buy with certainty. Do so much more with one vehicle. This Ford Escape gives you everything you need an automobile to be. This 4WD-equipped vehicle will handle beautifully on any terrain and in any weather condition your may find yourself in. The benefits of driving a 4 wheel drive vehicle, such as this Ford Escape Titanium, include superior acceleration, improved steering, and increased traction and stability. This low mileage Ford Escape has barely been touched. It's the next best thing to buying new. Marked by excellent quality and features with unmistakable refined leather interior that added value and class to the Ford Escape More information about the 2014 Ford Escape: Back for a second year after a radical redesign, the 2014 Ford Escape doesn't bear any likeness to the model it replaced-- it's a sleek, rakish, modern design, yet surprisingly roomy inside. Also surprising is how well the Escape responds and handles--as if it were a sport wagon. Escape's powertrains are standouts in this class, both offering more power than you get elsewhere plus excellent fuel economy. In terms of tech features, between MyFord Touch, an active park assist system and active-safety features like BLIS, the Escape stands far apart from more plainly presented crossover wagons. This model sets itself apart with Stronger performance and better handling than other small affordable crossovers, excellent fuel economy, impressive maneuverability, rakish exterior and fashionable cabin, spacious interior, and excellent MyFord Touch connectivity WWW.GREENWOODAUTOMOTIVE.COM for all Photos Our Dealer Handling fee of $499 is included in our advertised price. Government fee's and licensing are additional costs. For best service and to check availability or to set an appointment to see and drive call Steve direct at 720-339-1516 or Marc at 303-552-7909 For more information. FINANCING AVAILABLE. TRADES WELCOME. *VEHICLE IS FULLY INSPECTED BY OUR MECHANIC. We are located 4 Blocks West of I-25 on North side Of Arapahoe, Behind US Bank at Syracuse St.